brings harmony to your sales team. customers to generate more sales. 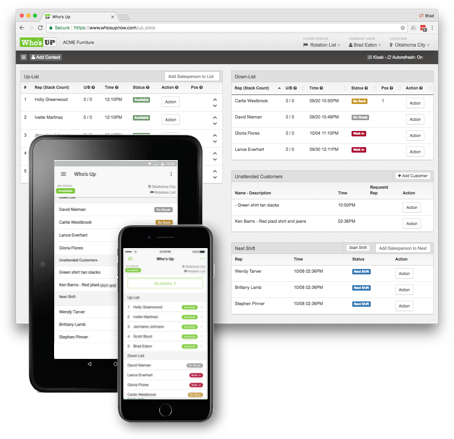 A simple retail up system, powerful contact manager / CRM, and intuitive reports that help you build more profitable sales teams. Who's Up provides a full featured retail up system that manages your up-list, shows the status of all sales people, and tracks time spent with walk-ins, be-backs and other sales tasks. 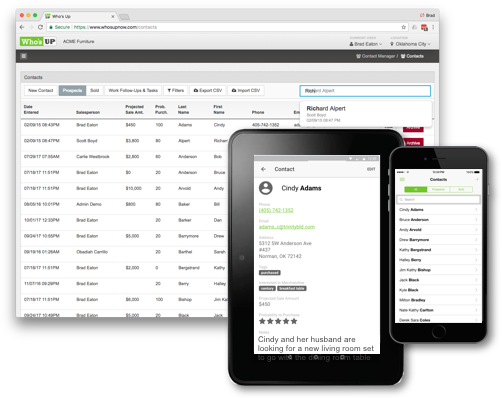 It includes a powerful yet simple CRM that allows your salespeople to enter, track and manage customer contacts including the value of their pipeline and probability to purchase. Automated drip emails ensure every customer gets a follow-up. Daily emails and push notifications remind salespeople to follow up. A suite of reports show you the performance of your individual salespeople, allow you to compare metrics between stores, see individual sales activities, show you when you're under and over staffed, and much more. As easy to learn as paper and pencil and even easier to use. Customizable work-flows for how your team handles ups, be-backs, phone pops, stacking, and more. Visibility of who’s on break, out on delivery, in the warehouse, out to lunch, or any other status you want to track. Timestamps let you know how long they’ve been there. Scheduling the starting position of salespeople arriving early for an upcoming shift has never been easier. When the shift starts, they all move onto the up-list in the order they arrived, without a single argument. Perfect for open floor times, all salespeople see when there are unattended customers in the store, along with their descriptions. When they become available, salespeople can easily spot and assist customers who aren't being assisted. Each salesperson enters and manages their own leads. All leads flow back to a central database that admins and managers have full access to review. Set reminders to follow up with customers and receive daily emails with the list of who to follow-up with and when. Hourly push notifications remind salespeople when follow-ups are past due. Drip marketing emails are sent to new contacts automatically. You control the messaging and schedule of when they’re sent. Each contact has its own time-line of activity. Drip emails, scheduled and completed follow-ups, daily activities, and other events all appear, showing a history of everything that has been done to make the sale. ps, be-backs, time spent with customers, number of leads each person is generating, along with their follow-up activity. Compare stats by individual salespeople or by stores. 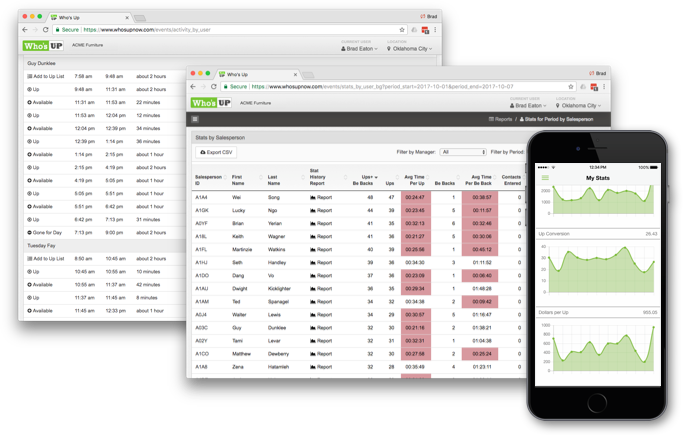 Import sales data from your POS and get additional insights into your team’s performance. Know each salesperson’s dollars per up, dollars per contact, up conversion rate and more. Floor Coverage report shows you exactly when your peaks and lulls are on every day. See where you’re under, and over staffed. Know exactly which objections salespeople are struggling with so you can provide them the training and coaching to overcome them and make the sale. “Who’s Up has totally changed the way we manage our sales teams. We have complete visibility into how each salesperson is performing. Since we started using the system, our close rates have improved, our sales team is happier, and the sales floor operates more efficiently with far fewer disagreements. Who’s Up is a mobile and web-based Up-System and contact manager (CRM) used by retail sales organizations to manage their sales team Up-list, stay in touch with customers, market to prospects, and access powerful floor coverage, traffic pattern and salesperson performance reports. Although Who's Up was initially designed for high-traffic, multi-store furniture retailers, a variety of businesses managing multiple, customer-facing sales teams enjoy the Who's Up mobile tools and rich performance reporting that work together to provide a better customer experience while increasing sales. 2014-2019 © PERQ Software, LLC. - ALL Rights Reserved.